I need 11 Easter cards and this is my 3rd one. I think I better speed it up don't you? I need to design a card that goes together quickly and make several of them. Don't you just love that new Martha Stewart Picket Fence Punch? I sure do!!! After leaving about 1 inch of plain paper underneath the fence, I stamped the flower border from Crafty Secrets Bird Lovers Stamp on the bottom. Before stamping, I colored the stamp with my Marvey Water Color Pencils. so I would get a two tone image. The focal point is stamped from the new Inkadinkado Floral Flourishes stamp shown below and I cut the frame for the picture out of the Foliage Frame Nestie dies and laid the picture on top of it. I used Scor-It tape to attach the stamped image to the frame. I had planned to put the frame on top, but my flower was too large, so I used it as a border instead. You probably have heard the old saying "measure twice, cut once".....well I didn't do it that way. Therefore, I had to make a minor adjustment and it worked! Have you ever had to do that? I love my new Rhinestones from Kaiser. This card called for glitz, so they were perfect. Joan, what a lovely card. I love the floral border with the MS punch. So creative! Now I need to get that stamp set! 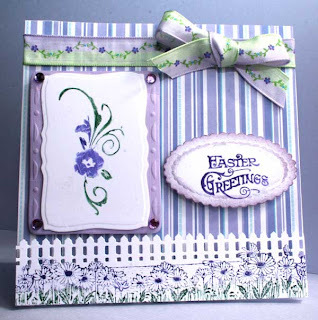 A very beautiful Easter card Joan, the colors are so perfect for the occasion, the MS punch is fabulous on this card! Joan this is just a gorgeous card!! Hope you are going to have a wonderful Easter weekend. YES! I love that picket fence! And it is perfect on your beautiful card! Have fun making the rest of those Easter cards! So pretty -- I Love the picket fence -- just darling! Beautiful card Joan ... love that ribbon!! !